What a beautiful day it was today. The day started early with sunshine and temps in the low 70’s for our RC Team debrief and Competitors meetings. Our personal weather forecast from JC of WeatherNJ.com had the wind coming from the SE to SSE at 10-12 knots with the slight potential of a late day sea breeze. We had a bit of a late start getting out of the harbor with all the equipment we had to load onto Latitude but that worked to our advantage as we were still able to get onto the racing area just as the wind filled in as forecast – thanks JC!. With the crack team we have assembled here we were able to get the Signal Boat rigged and the course set within 30 minutes for an on time start. The first race, a Course 2, ran a bit long as the wind did not build as quickly as we had anticipated. We had the weather mark set at 130 and 0.7 nm out but with the average wind speed running about 8 knots the Course 2 was running long. We signaled Charlie at the 2nd gate rounding with the new mark at 0.5 nm and the fleet finished in just under 50 minutes. 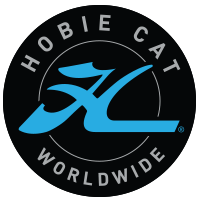 Interestingly, the first boat to finish was the Hobie 16 Women’s team of Chris Bradshaw and Nancy Kornblum having sailed through the entire Hobie 14 fleet after starting 6 minutes behind them. Race 2 we decided to keep the same course geometry but go with a Course 1 but the now building breeze (now averaging 11 knots) made the race short with the first boat to finish, Dan Borg’s Hobie 14, in just over 32 minutes. This race we put 4 minutes between the starts so the Women never caught the Hobie 14 Fleet, a beautiful thing. Race 3 saw a slight right shift as the sea breeze started to fill in and it was early. We adjusted the course to 140 but kept the same 0.7 nm length and ran a perfect Course 2. The fleets both finished in 47 minutes with the breeze topping out at around 15 knots. Race 4 would wind up being the last race of the day as the wind began to swing further right to 170. This put us in a position where we had to either move the entire course or get creative in our thinking. Due to the position of our Signal Boat, this shift would have put the breakwater of the mooring field in a questionable place in relation to the starboard layline. We decided to move the leeward gate to a position downwind of the weather mark which put it on the extreme left outside the starting pin. We figured with a square line the position of the weather mark was okay – it was upwind but skewed to the left. I have to admit, the course looked really cockeyed and we communicated that to the competitors over their VHF channel. Our intent was to start them on a square line, be sure the subsequent runs and beats were truly square to the 170 degree axis and move the finish line over below the new gate location. It worked like a charm with the wind beginning to die as thunderheads moved in from the west putting the proverbial fork in the days racing. It was a great day on Sandy Hook Bay that ended with a great little feast of finger food and a Rum Squall back at the club. Today was another fabulous day. We had our morning RC Team meeting to discuss our plan, what equipment changes needed to be made and any adjustments to the course geometry. We decided to start the Women on the longer 14 line, added some counter weights to some of the marks and basically just tightened up the loose ends. Competitor’s meeting was spunky. We discussed the plan of the day, the weather forecast and the responses to the Event Survey we sent out last night to all the competitors. On the water for an on-time start of 1100. Wind was stronger than yesterday at 10-12 knots from 145. We moved the course to the north and east taking it out from under the hill on the right shore line and more in line with the sea breeze coming out of the river. First race, course 1 with a distance of 0.9 was a fabulous start to the day. For the second race of the day, we stretched the distance to 1.0 and ran another course 1. Well, the wind continued to build and by the end of race 2 it was averaging 13 and staying more near 15 knots. The wind went a bit right to 160 and continued to build for race 3 of the day. One problem in moving the mark to the right at the 1.0 nm distance is it would put the mark to close to the hillside so we decided to pull the mark down to 0.8 and run a course 2. This combination gave us a beautiful 40-45 minute race. The last race, race 4 of the day we decided to start the women first since even giving them a 5 minute delay in starting after the 14s was not enough as they consistently caught them. Starting them first hopefully would keep them out in front but no, they lapped the 14s with ease and actually had the leaders finishing in the middle of the 14 fleet. Oh well, those Hobie 16 Women are FAST! Again, it was a great day. It saw the strongest breeze yet. We had a fair number of flips, pitch poles and turtles and our crack jet ski team of Smarty 1 and Smarty 2 were all over it like white on rice. We saw some of the closest competition in both fleets with the leaders mixing it up, finishing within mere seconds of each other. Couple of protests to be heard in the morning. One I know is redress and I am not sure of the other one. What a fantastic final day to a fantastic regatta. Wind held to the forecast and was WNW (280-295) freshening to 15-17 knots all day! We had an on-time start going for race 9 when the wind shifted right but did not leave us enough time to adjust the starting line and we had to AP the start to reset. After reset a wonderful 38 minute course 1 was in the books for with the weather mark initially set at 0.80 and then stretched to 0.98 on the final upwind leg. For race 10 nothing had to be changed. We needed to run a race that was on the short side of our target times in order to start the Atlantic Highlands Yacht Club’s Blue Water on time at 1300. Our team was right on top of it all. As I was prepping for the change to start the 3 divisions for Blue Water our Pin/Gate boat called asking to finish 2 stragglers at the gate. No sooner did we give the okay the Weather mark boat calls and says there is a straggler at their end of the course asking permission to finish them and send them home. Permission granted. All Hobies are finished and the 1st Blue Water division’s sequence starts 3 minutes later, on time, at 1300. After Blue Water starts were completed we went back into sequence for race 11 without changing the course as the wind was locked in. Again, the winds stayed strong and the regatta ended on a high note; 11 races in really nice breeze over three days! What more could you ask for. The final party was a collaborative effort between the Mini-Mega and Blue Water with a nice barbeque, DJ, drink and some fine sharing of stories. This event is now in the books with our new North American Champions – Dan Borg, CA winning the Hobie 14s with 14 points and the rock star team of Christina Bradshaw and Nancy Kornblum with 17 points. 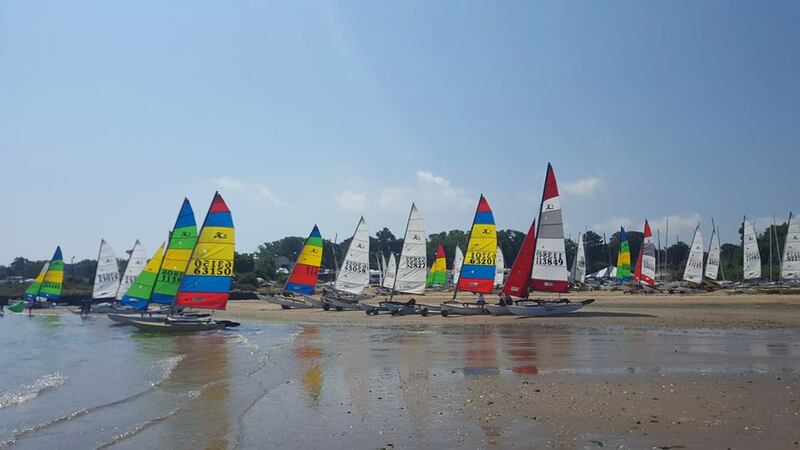 The Hobie 14s were a hot contest mainly between Dan and Mark Modderman but Herb James and Billy Jeffers kept it very close right to the end. Same with the Women. It was one of the closest contests I remember with the ladies trading placing up and down the course. The top three teams of Bradshaw/Kornblum, Korzeniewski/Donigan and Tartaglino/Modderman pushed each other all over the course for 3 days with just 7 points separating first to third.